Martin O'Neill and Roy Keane will reflect this morning on the fine line in football. A year ago they took their Ireland team to Copenhagen and played out as boring a scoreless draw against as the one in Aarhus last Monday night. The difference was, in 2017, it was a World Cup play-off and three days later we would have the Danes in Dublin for the return game. A place at the World Cup Finals was there for us. It certainly seemed so when Shane Duffy scored after four minutes. Inside the next ten minutes, James McClean and Daryl Murphy would miss glorious chances to put Ireland two goals up. Had either gone in, Denmark would have imploded the way Ireland did, the Boys in Green, and their thousands of supporters, would have been at the World Cup last June and Martin O'Neill would be the current Irish Sports Manager of the Year. Now, by mutual consent, it is all over. It's as if that hammering by Denmark 12 months ago has taken all the air out of Irish football, like puncturing a football - we simply haven't been the same team since. And Martin and Roy have, it appears, come to the conclusion that they are not the men with the foot pump to put life back into it. 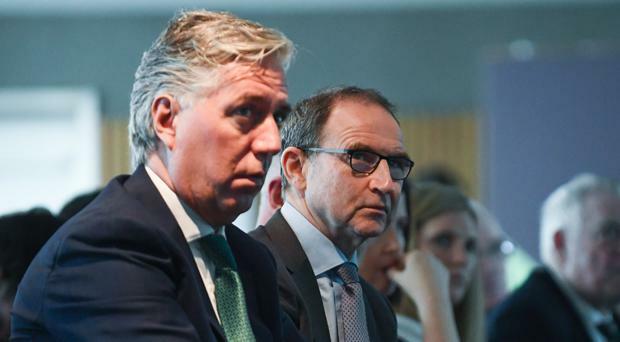 Now the FAI face the embarrassment of hosting the great and the good of European football in Dublin on Sunday week for the Euro 2020 qualifier draw without a national team manager. Would they make a quick appointment to get over that problem. If so, Mick McCarthy would be the obvious candidate. Stephen Kenny of Dundalk must get a mention too, would the FAI be willing to gamble on the Lilywhites' boss? Or will they go through a long two-month process and come up with a 'springer' as Giovanni Trapattoni was in early 2008. Problem is if they go that way, and Ireland get a tough Euro draw, say France and Russia as the seeds ahead of us, no top manager will want the gig. The one thing is, though, whoever that new manager is, he will be working with the same players Martin and Roy were. We can't 'buy' a goalscorer, we can't 'buy' a winger to set up chances for the that goalscorer. To improve our players, once they become adults, Irish football is at the mercy of the English Premier League, a League that is looking worldwide for talent, not just to the island next door.